NEW YORK (CNS) — In 2004, Japanese game developer Hideki Kamiya was working on a demo sequence of a running wolf. Intrigued by what he saw, Kamiya decided to develop the clip into a full game. 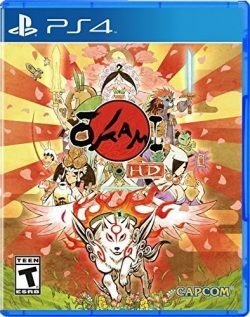 The result is “Okami” (Capcom), a game based on Japanese mythology and folklore and considered a masterpiece by many critics. Hugely popular and praised, “Okami” has recently been reissued in a high-definition edition playable on PC, PS4 and Xbox One. Although free of objectionable language and sexual elements, “Okami” does include some bloodless war violence, making it unsuitable for the youngest players. While there are elements of the Japanese religion of Shintoism in Okami, a comparison can also be made with J.R.R. Tolkien’s Christian classic “The Lord of the Rings.” Like that epic, “Okami” chronicles the rise of a long-dormant and evil darkness that has to be confronted with beauty and mercy. “Okami” tells the story of Amaterasu, a Shinto sun goddess who has taken the form of a white wolf. Amaterasu is awakened a hundred years after her battle with the nine-headed demon Orochi, who was imprisoned by the sword of Amaterasu’s heroic ally Nagi. When a thief lifts this weapon from the shrine in which Orochi is held captive, he too awakens. Although over a decade old, the graphics of “Okami” remain crisp and delightful. The game is presented in a woodcut-watercolor style that looks like an animated Japanese ink-illustration, popularly known as an “ink-wash” painting. “Okami” begins with a long introduction that sets up the plot — and that requires patience. This is followed by a blend of various gaming genres. Gameplay takes about 30 hours. Amaterasu and her sidekick Issun, a buglike creature, collect supplies and weapons to confront Orochi and the demon’s many manifestations. Amaterasu and Issun also meet characters who are based on literary figures from Japanese folklore. Most Westerners won’t fully appreciate the nuances involved in references to people such as Kushi or Kaguya. But an inability to pick up on these subtleties doesn’t detract from the enjoyment of the game. A main method of conquering Orochi is the “Celestial Brush,” which can be used to disarm a foe or to transform black and white landscapes into color. It’s a lovely way of expressing the colorful diversity of goodness as a curative to the bland sameness of evil. The game contains stylized depictions of combat. The Catholic News Service classification is A-II — adults and adolescents. The Entertainment Software Rating Board rating is T — Teen.